Wool is a fabric made by different animals’ hairs. It can be processed to obtain different finishes and features peculiar to every different type of wool, such as cashmere, mohair, angora, and merino. Wool is extremely good in keeping you warm, and by releasing heat at a lower but constant rate, is perfect for winter time. Nowadays you can find wool declined in many different ways. So, if you never considered adding wool to your garderobe or just looking for some inspiration, check the nice ideas below. This might seem obvious, but wool coats couldn’t be the first item to think about when talking about winter clothing in wool. Good quality wool will keep you not only warm but surprisingly dry as well, even in a wet environment. This plaid pattern is perfect for the winter season, with cold tones such as blue, white and greyish nuances: goes perfectly not only with skinny jeans and a simple white top, black boots and bag but also with a total black look for night and evening time. A sweater is typical for winter days, to wear anytime along with simple denim jeans or skinny pants and sneakers or combat boots; but if you want to look modern and up-to-date choose a basic sweater in oversize style. Go for super long sleeves and tuck your sweater in your pants to be super stylish; wear a furry coat on top to finish off your wintery outfit. Want to add an elegant touch? A small crossbody bag with chain will do the trick. Flowy maxi skirts are not a summer thing anymore; this beautiful draped maxi skirt comes in mélange grey tones, and is perfect for cold winter times, being in solid wool fabric and providing you with heat and warmth both during day and night. Keep it simple with a white top and black boots: choose combat boots for day if you want to be comfortable, and heels for evenings and special occasions to look super elegant. Sometimes all you need is just one piece to style a whole outfit: this can surely be said for this beautiful dress. In a cold stone blue nuance, made by heavy wool fabric, with a V-shaped neck, short sleeves, narrow high waist and ankle length, this dress is perfect for those of you who love to be sophisticated and wear refined and polished outfits for winter. Style it with a long coat and light precious heels, an artisanal mini bag, and look wonderful in every situation. Patchwork textiles are a perfect way to give a touch of color to every plain and basic outfit: and which fabric could be perfect for a patchwork effect? Wool, of course! This cardigan made with blue and light blue nuances together with camel and white, is perfect to throw on a basic outfit such as a white top and skinny denim jeans, for work, daytime, and daily trips. It will keep you cozy and comfortable, yet warm and dry. If you’re not afraid of cold, wear it with the super stylish ballerina-inspired flats, otherwise go for ankle boots or combat boots for a more aggressive casual look. Over the knee socks are good for winter if made by heavy materials such as wool: they are also a current trend, so why not wear them with a breezy and fresh look such as this one? Black over-the-shoulder top, high waisted grey skater skirt, burgundy over the knee wool socks, and knee high black boots with silvery details: this look is perfect for younger women along with a furry coat or a long trench style coat. This look is good for daytime, for going shopping or seeing friends, while keeping it comfortable and stylish at the same time. Infinity scarves are an evergreen, and they come in all shapes and sizes, but this basic black one is always one of the most versatile and can easily adapt to every outfit and every situation. Being so chunky and oversize, it will be the perfect match for those of you who live in extremely cold climates, or are just always cold! Wrap it around your neck multiple times during daytime, or wear it loosely for a more fashionable look in the evenings, this scarf will be perfect for a casual but chic and stylish look. 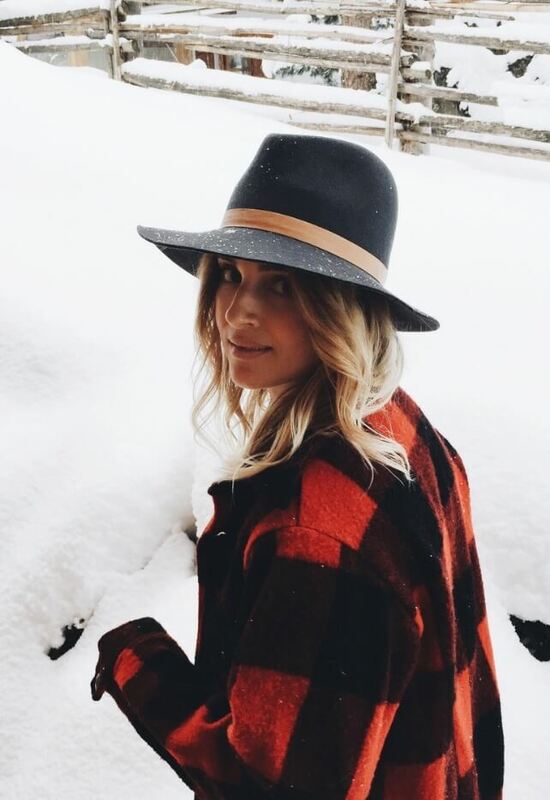 Fedora-style hats are an endless classic garment that never goes out of fashion; with the rise of big and oversize hats that has been going on in the recent years, going for this shaped hats for this winter would be a good idea. Choose a wool option to keep you as warm as possible through rain and why not, even snow! Darker nuances are usually the most common ones, wear them along with a total black outfit to maximize the elegant effect or wear them with colorful items such as a plaid coat, and you will end up in a classic winter outfit traditional yet stylish and fashionable.